SAN JUAN, P.R. — As home to the busiest port in the Caribbean, the cruise ship port here welcomes millions of tourists every year. But unlike a resort vacation, where a person might stay in the same hotel for a week, most cruise-goers aren’t in San Juan for more than five hours to a full day at most. This relatively short period of time doesn’t leave much room for unplanned exploration of all San Juan has to offer. To help, we offer a list of must-see destinations for the time-conscious traveler. Just about all of the narrow streets of Old San Juan have a water view (Photo by Veronica Sepe). The Port of San Juan, where all cruise ships dock, is conveniently located in Old San Juan, where a wide array of attractions, dining and nightlife await. A cab is hardly necessary to reach most destinations, although they are readily available if needed. 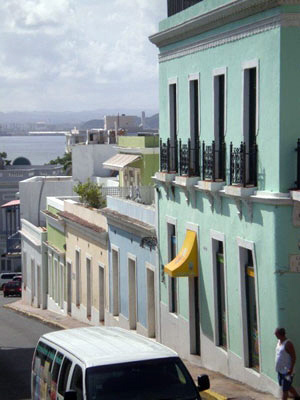 Visitors can walk or even take a free trolley that covers most of the island that is Old San Juan. At the top of most travelers’ itineraries are the destinations San Juan is known best for, namely the forts of San Felipe del Morro and San Cristóbal. They form the foundation of the San Juan National Historic Site. San Cristóbal is just a 10 to 15 minute walk up the hill from the port. El Morro is clearly visible from San Cristóbal and about a 20-minute walk. Admission to the forts is $3 each or $5 for both. Depending on the time of year, different tours throughout the forts are offered free-of-charge, two to three times a day, mostly on the weekend. The tours have a variety of different themes, from exploring the tunnels of San Cristóbal, to taking a walking tour of grounds only accessible with a park ranger. A guard house at one of the forts that are part of the San Juan National Historic Site (Photo by Veronica Sepe). Unless accompanied by a major history buff, touring both forts shouldn’t take more than two hours, leaving time to explore other areas of Old San Juan. 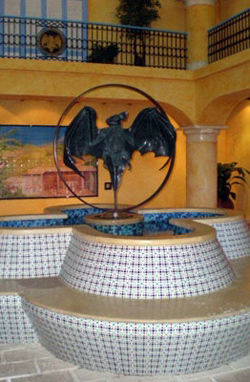 Another exciting destination is Casa Bacardi, home of the Bacardi rum distillery. The distillery, located on the other side of San Juan Bay, is accessible by ferry for only 50 cents. Once on the other side, taxis wait to take visitors the 1.5 miles to Casa Bacardi. The taxis typically cost $3 each way, but are worth it, considering the tour is free and includes two drinks per visitor. The tour includes a video about the history of Bacardi rum, an explorative area where people can smell all the varieties of rum Bacardi makes, and a quick bartending tutorial on how to make the classic Bacardi drinks. At the end of the tour, visitors can walk through a gallery of Bacardi ads dating from the beginning of the 20th century and send video e-cards to friends around the world. The Bacardi store offers a wide variety of Bacardi products and discounted bottles of all the different varieties of rum. A large patio outside the store houses the bar where visitors can redeem their free drink tickets. mojitos, Cuba libres, and Bacardi daiquiris are some of the most popular. 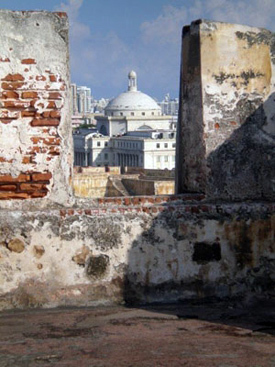 A view of Old San Juan from the San Juan National Historic Site (Photo by Veronica Sepe). Those with a tight schedule should plan to spend about three hours, including travel time, at the factory, allotting ample time to enjoy the complimentary libations. Although cruise lines are known for their wonderful (and pre-paid) food, it would be an injustice to Old San Juan’s delicious dining options to look them over in favor of the buffet line. The city offers restaurants for every budget, schedule and palette. For breakfast, La Mallorca is a popular and affordable choice. A local favorite, this diner is a short distance from the forts and an excellent way to start the morning. The signature breakfast dish of La Mallorca, and perhaps all of San Juan, is a pressed sandwich dusted with powdered sugar, often containing ham and cheese. The combination of the sweet sugar, the savory cheese and the salty ham make an unlikely, but scrumptious, combination. The price and service aren’t bad either. A mallorca con jamón y queso and a café con leche only cost about $4.05. The waiter was prompt and served the food within 20 minutes of taking our order. 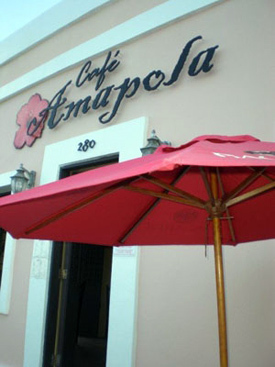 Café Amapola is a café conveniently located on Calle Norzagaray between San Cristobal and El Morro. The second floor patio offers a stunning view of the Atlantic Ocean and both the forts. The menu features both traditional Puerto Rican fare, as well as more Westernized dishes. The appetizers ranged from $4 to $10, while entrees and salads were from $6 to $20. A full bar had, along with the traditional beverages, a house drink menu, that featured a variety of tropical drinks for $6 to $8. Café Amapola is a popular stop for day visitors in Old San Juan (Photo by Veronica Sepe). While the food was delicious and the prices reasonable, the service was a tad slow, something to keep in mind when on a tight schedule. But if there is room on the itinerary for a lazy afternoon lunch, Café Amapola is a good bet. Good for lunch or dinner, El Patio de Sam, is often recommended by the locals for its unique atmosphere and juicy burgers. It’s location amid the bars of Calle San Sebastian make it a good place to eat before a night out on the town. El Patio de Sam has extensive outdoor seating that overlooks both a statue of Ponce de Leon and the Iglesia de San Jose and the inside has the welcoming, if albeit slightly dingy, charm of most local hangouts. Music from the nearby nightlife can be heard from all sides of the restaurant and only adds to the atmosphere. The service was more than friendly. Our waitress was helpful in deciphering the names of traditional Puerto Rican entrees and was patient with our group of 10. The prices were reasonable and ranged from $9 to $11 for a good-sized meal, but went all the way up to $35 for a platter. Drinks were $6 to $8, which is standard for most bars in the area. Many cruise ships dock in San Juan in the early evening and stay until 2 a.m. so passengers have the opportunity to try their luck at one of Puerto Rico’s many casinos. For the not so lucky, this also means a chance to explore the thriving nightlife of Old San Juan. The hands-down favorite spot of both locals and tourists is the Nuyorican Café. Hidden on a narrow alley between Calle Fortaleza and Calle San Francisco, the Nuyorican is easier to find than expected. The line snaking out the door and the thumping salsa music are a dead giveaway that this is the place to be. A $5 cover is all it takes to get in the massive wooden doors. Once inside, the size of the bar is surprisingly small, yet not cramped, as the ceilings are quite high. A stage hosts everything from improv comedy to salsa bands and the energy is always high. Art is displayed for guests to the Visitor Center at Bacardi, a short trip from the passenger docks in Old San Juan (Photo by Veronica Sepe). The drinks were reasonably priced and the bartenders were friendly and even willing to buy a few rounds. The nightlife in Old San Juan doesn’t really get going until after midnight, which might mean choosing only one bar for the evening. Although trendy bars abound in this area, the Nuyorican is the one that can’t be missed. Old San Juan is home to plethora of activities that appeal to all the senses. As difficult as it may be to leave the comfort of top-deck pool, it is well worth the trip. 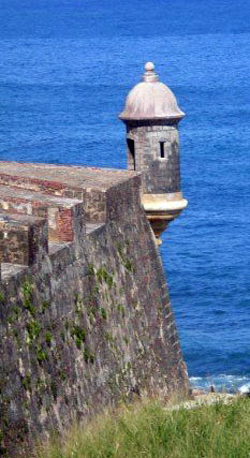 Fort San Cristóbal and Fort San Felipe del Morro: 501 Calle Norzagaray, 787-729-6777, http://www.nps.gov/saju. Call ahead for tours as the time and days vary based on time of year. Casa Bacardi: 787-788-8400, http://www.casabacardi.com, Tours Mondays to Saturdays 8:30 a.m.-4:30 p.m.
La Mallorca: 300 Calle San Francisco, 787-724-4607, Main dishes $5-$10. Cafe Amapola: 280 Calle Norzagaray, 787-392-9811, http://www.cafeamapola.com, main dishes $8-$30. El Patio de Sam: 102 Calle San Sebastian, 787-723-1149, Main dishes $9-$35. Nuyorican Café: 312 Calle San Francisco, 787-977-1276, http://www.nuyoricancafepr.com.